Amazon indigenous communities have made huge strides in the last two decades to secure legal recognition for their ancestral lands – territories which play a major role in efforts to conserve rainforests and stabilize the global climate. But there is still much work to be done. Many protections for indigenous lands are still precarious and once land rights are secured, the key challenge remains: how to keep these lands economically viable for their ancestral owners in the face of often overwhelming economic pressures from mining, logging and commercial agriculture to exploit the lands in destructive ways. 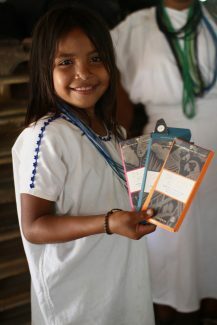 Environmental Defense Fund (EDF) and Ecodecision worked with the Organization of the Indigenous Peoples of the Colombian Amazon (OPIAC) to identify examples of indigenous-led enterprises from the Amazon that were contributing to better incomes and creating local value for indigenous territories. The goal was to better understand how indigenous enterprises support their culture, the challenges they face, and the scope for replication and growth. We found indigenous enterprises of the Colombian Amazon are as diverse as the people, flora and fauna of the region. There are dozens indigenous enterprises in the Colombian Amazon and they vary in product offerings, organizational forms, and market sizes. We selected some of the most developed ones with the ability to deliver products (domestically and internationally), gender involvement, external partnerships, and potential for investment. Mambe.org is a non-profit that partners closely with indigenous peoples and places a focus on indigenous women and their artisanal products. It operates a storefront in Bogota that sells the women’s crafts. In addition to the storefront, Mambe.org makes connections between indigenous communities’ ecotourism offerings and tourists. The board of Mambe.org includes indigenous representation, but some of its day-to-day operations aspects are managed by non-indigenous employees. Selva Amazonía is an indigenous enterprise of the Nasa tribe that makes cosmetics based on ingredients collected from the forest and uses traditional and sustainable techniques for harvesting with a strong role for women. Its legal representative is a woman and women play a strong role in the production of its products. ASOPROCEGUA, the Association of Agricultural Producers for Economic Change in Guaviare, has been growing quickly over the last couple of years by processing Amazonian fruits. It sells its products whole sale and retail in Bogota, Medellin and Cartagena – a rare example of an indigenous enterprise commercializing its products beyond Bogota to other parts of Colombia. Its purees of the non-traditional Amazonian fruits are important ingredients to a fast-growing ice cream company focused on Colombian flavors and ingredients. The Indigenous Central Cooperative of Cauca (CENCOIC) is a coffee producer organization with 2300+ producing members, which recently celebrated its 37th birthday. It has much to celebrate as it also recently exported its prized coffee to roasters in the US, UK, New Zealand, Germany, France, and Australia. Its members follow conservation best practices that mandate the conservation of forests, water sources, and other natural commons. Despite the diversity of indigenous enterprises in product offerings, organizational structures, and market sizes, they all face common challenges in terms of access to markets and finance, and the need to continually improve their business administration capabilities. Flexible funding and support mechanisms are highly needed for indigenous groups to consolidate and grow these enterprises based on their hard-won territorial rights and rich natural and cultural heritage. Over the next year, EDF with OPIAC and partner Canopy Bridge will explore how to further scale these examples and the many other indigenous enterprises in Colombia. This will include connecting them with new buyers from the US and other countries. Best practices will also be shared between them and aspiring indigenous leaders and entrepreneurs to further strengthen the sector. Indigenous enterprises and the values embedded in them are an essential component for tropical forest conservation and empowering indigenous peoples to control their own destinies. These case studies are part of a broader effort to inventory economic enterprises lead by indigenous communities in a comprehensive online database.